The Paps are perhaps two of the most recognizable mountains in Ireland when viewed for their northern or southern approaches. at the office to check my emails on the way took three hours - the joys of working! I paid a quick visit to the Sport Corran Tuathail to buy a copy of OS map 79 as naturally I had managed to forget my own. much later than I would have liked. There is plenty of room to park four or five cars here without being in anyone’s way. I wasted no time in setting out up the track towards Lough Glannafreaghaun, past the sign written in marker on a plastic bucket lid for " Shrone, The City”. Does anyone have a clue what its supposed to refer to? On the way up this track you pass through three gates and after the third you emerge beyond the trees marked on the map. There is nothing for it but to start the steep climb up the first Pap (I don't mean to be rude). After approx. 100 meters of height is gained to the first crest go left for 50 meters before again climbing again to the right along a wide, steep cleft in the hill. This avoids having to struggle through the rough boggy very steep stream bed if you just went straight on. The summits of both these mountains are marked with large Cairns which apparently cover ancient tombs. From the Paps east a descent of approx. 100 meters brings you to the col and then its another sharp climb up the Paps west of 100 meters. I headed back down to the col and then contoured around to get back to the track I had walked in on. I arrived back at the car just as it was getting dark at around 5.00pm. 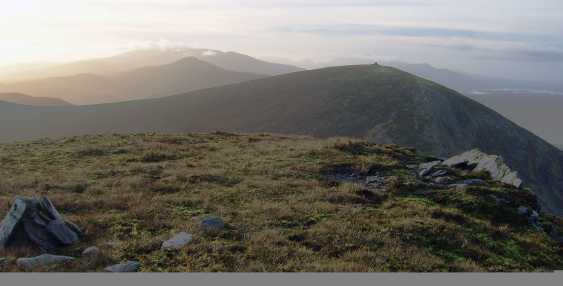 The photo was taken just before sunset from the Paps east with the Paps west in the center and behind are Crohane, Stoompa, Mangerton and the Reeks over the Lakes of Killarney.